I found Arnheim's discussion of artists in this chapter very interesting, particularly the part where he discussed how an artist is able to express "the nature and meaning of an experience" while "the non-artist is left 'speechless' by the fruits of his sensitive wisdom" (169). He goes on to say that the non-artist "can express himself, more or less articulately, but not his experience." He then says, "During the moments in which a human being is an artist, he finds shape for the bodiless structure of what he has felt" (169). I find this very interesting, being an artist myself. I have always taken great joy in utilizing art to express things that I cannot say in words. It is like the Georgia O'Keeffe quote I used in my first post, "I found I could say things with color and shapes that I couldn't say any other way...things I had no words for." Sometimes I can put an idea to words, but it is better expressed in a painting. I think this is interesting when thinking of things like art therapy and analyzing children's art. The lovely thing about being a child is that no matter how "good" of an artist you are, you are encouraged to draw and your work is praised. I wish that it stayed that way throughout our entire lives, because I think that visual expression is a gift, and there should be no measure of "good" and "bad;" we should all feel free to use art to express ourselves. Another quote I thought of during this reading was one by Pablo Picasso: "It took me four years to paint like Raphael, but a lifetime to paint like a child." This is especially interesting after this week's reading focusing on children's art. Did Picasso really paint like a child? Was that literally his goal, or were there just certain elements from children's art that he was attracted to? Clearly after this week's reading, what is going through a child's brain while drawing is very different than what is going through an adult's brain, so perhaps as an adult, it is nearly impossible to truly draw like a child. I just thought this was an interesting quote and one to ponder what exactly Picasso meant by that. I was very interested in Arnheim’s discussion of some of many of the theories about children’s art, mainly the artificial distinction between the use of conceptual and perceptual processing in children’s drawing. Conceptual understanding would cause children to represent “the overall qualities of objects.” Perceptual understanding would rely on a child representing what they see. In reality, children usually leave out many details and this does not mean that they do not perceive them. Arnheim reminds us that visual perception does not encompass “the totality of individual appearance,” but in the “grasping of global structural features.” Our visual perception, and thus our art, reflects our gestalt perception. In addition, art emphasize different aspect of our visual processing system and is concerned with the purposes of the art for the artist. In studying children’s art for conference work I have come upon all kinds of psychological measure attempting to qualify children's art in terms of cognitive or emotional development. Such standards absolutely do not take into account the range of conceptual, perceptual, and representational concepts that the child is attending to simultaneously. For example, tests that measure cognitive development are often concerned with the quantity of body parts depicted in children’s human figure drawing. A five-year-old student of mine decided to include ears in a family portrait last week. However, he told me he was not giving ears to his mother or sister because “you can’t see them so good.” I think this was a great examples of how a child may be using a range of perceptual and conceptual measures in the artistic process that could are easily misconstrued by the inattentive tester or teacher. Arnheim writes “[t]he discipline of intelligent vision cannot be confined to the art studio; it can succeed only if the visual sense is not blunted and confused in other areas of the curriculum. To try to establish an island of visual literacy in an ocean of blindness is ultimately self-defeating. Visual thinking is indivisible (206).” I think that this is particularly relevant as we begin to explore the intersections of art and science in the Kemp readings. I think that visual arts can also be confined by making assumptions about the purposes of art and the intentions of the artist. The cognitive psychologist sees only cognitive development in the child’s art. The psychoanalyst sees only unconscious expression in the child’s art. The teacher sees only pre-literacy skills. This fracturing of intention does not take into account the full meaning of the art, and of art in general. This weeks reading on connecting developmental theory with gestalt struck a chord with me because of some work I did last year with the kindergarten class at the ECC. The consideration of the student’s perceptual identity was particularly important for me because I would conduct art lessons with them once every two weeks or so. Whenever there was “art time” when I was in the classroom, I was put “in charge” of this as well. All of the specific lessons I did were related to the subject matter governing the curriculum at the time. For example, during the month or so when the student’s were learning about the human body, we explored the art of making pictorial diagrams of different parts of the human body. Another good example is a lesson me and another teacher guided together, where we created origami airplanes, jet planes, and rockets to creatively understand the ideas of flying machines. When I was reading this chapter I found the majority of what Arnheim was saying about the inclination toward simplicity to be true. However, in the first half of the reading I couldn’t help but be reminded of the countless times when the students would beg me to draw something for them, or draw an example for them. They were seemingly frustrated at their level of motor functioning, and wanted to draw reality as they saw it. This disconnect was elaborated on in his section on “obliqueness”; “Obliqueness is always perceived as a deviation, hence its strong dynamic character. It introduces into the visual medium the vital difference between static and dynamic shapes, still undifferentiated in the earlier phase.” (Arnheim pages 187-188) The process of mastering obliqueness seems to be cognitively understood first, and after a time of exploration (which includes some frustrating “failures”), realized physically in the child’s artwork. The next definitive elaboration on the mental strife a child goes through during perceptual growth is in his section on “educational consequences”. Experientially, I understood the difficulty he speaks of on the part of the teacher. This difficulty generally being; knowing the balance between showing your student how to do something and allowing them figure it out on their own. “…to teach everything and to teach nothing.” (Arnheim page 204) This balance is definitely hard to achieve, but as I believe Arnheim to be saying, the stress should not be placed in your identity as a teacher, but in the reactions to your student’s identity. “…all teaching should be based on an awareness that the student’s visual conception is growing in accordance with principles of its own, and that the teacher’s interventions should be guided by what the individual process of growth calls for at any given time.” (Arnheim page 205) Arnheim then goes on to discuss the conflict between social urges and the demands of what is best for the development of the individual. I found this to be the hardest confliction to react to as a teacher. I suppose Arnheim’s advice for me would be summed up by this quote, “Such social motives must be distinguished from the cognitive motives that arise from the state of the student’s visual development. The former must not be gratified at the expense of the latter.” (Arnheim page 205) For me, the most interesting part of that last quotation is the word “gratified”. My maternal instincts with the student’s were to do just that. I found it intuitively sound to want to instantly boost a student’s level of confidence by showing them how to do something instead of allowing them to painstakingly figure it out for themselves. The idea that as a teacher one must separate themselves from this natural response a bit (but not entirely, as Arnheim does stress the idea of balance) for the betterment of their student’s comprehension is hard to swallow at first, but nonetheless a very efficient model. 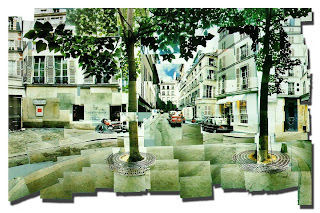 This photomontage by David Hockney was created by taking many snapshots of one subject and then arranging them in a patchwork to form one image. The resulting image has a similar effect of a peice of Cubist art, and within the cubist paradigm, challenges our notions of depth perception. I also think a correlation can be drawn with impressionist artwork, in that the reality of viewing a scene does not coincide with realist artwork. We do not perceive every detail of a scene in one moment. Our eyes move over the scene, and this requires an interim of at least a few seconds. If you are outside (as this photomontage depicts), environmental shifts in lighting and slight changes in atmospheric conditions have already skewed from one portion of the scene to another. I am not entirely sure how this relates to our discussion of stereopsis, but I am sure that Hockney is challenging our conceptions of depth perception. 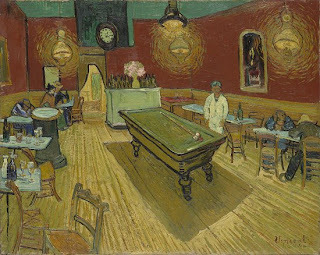 Van Gogh's Night Cafe also seems depthful to the viewer. His use of thick paint gives this painting a relief effect. Also the view into the room demonstrates asymmetry which is discussed in Arnheim as a method of portraying depth effect. 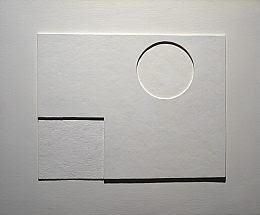 I struggled with this assignment and finally decided on this Ben Nicholson, White Relief 1935. This is a painting that connected painting and assemblage, creating a relief effect. This painting does seem depthful as a result of its construction. The circle and square recede and the slim shadows this recession creates illustrate their depth. I thought this was an interesting choice because the lines between sculpture and painting are being blurred. The New Yorker cover caught my eye last week as we were talking about depth. The piece, "A Very Long Tunnel" by Brian Stauffer, uses a large range of luminance to portray depth. The symbolism of the piece is enhanced by the use of an exaggerated light source from the back. I also think that it is interesting that the blue part at the back seems to also have depth because of the gradient in light from dark blue, at the top, to light at the bottom. Is this effect similar to that used for atmospheric perspective? This effect seems to make the blue look more realistic while the red has a garish, dusty feeling. Again, the symbolism is enhanced. 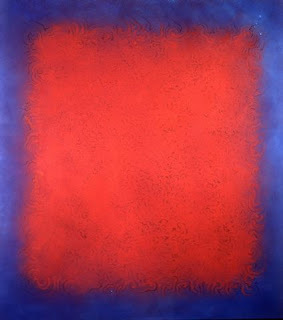 While interning at a contemporary art gallery this summer I got to know the work of Indian artist, Natvar Bhavsar very well and was intrigued by his unique method of transferring paint to canvas. He sifts pure, dry color pigment onto each of his canvases without ever physically touching it with his own hands. He would repeat this process over and over again, forming layers of pigment. This created a textured and rhythmic surface which could not have been achieved through traditional brushed on paint. Although it is hard to see in this online image, when you stand in front of one of his works in real life the color jumps out at you and you can clearly see the depth of the paint and how many layers had to be created in order to make the final piece extraordinary. Bhavsar definitely plays with this idea of depth and therefore his paintings are far from flat and two-dimensional. While I was looking at pictures for my conference project, I decided to find a painting by the artist I am researching for this assignment. This one, Theologue, struck me as portraying the most depth. In this painting, Grey portrays two parallel planes with the use of grids. However, these grids recede into the painting, much like roads that go on for miles. These planes separate the human figure from the flames below and the mountains behind him, yet the lines flow within the transparent figure as well. 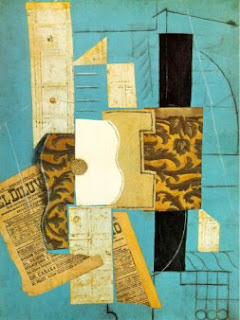 In this collage work by Picasso called "Guitar," Picasso uses 3-D elements to play around with depth in an interesting way. Picasso is playing around with the idea of depth and the idea of the parts versus the whole. All of these different pieces on top of each other create a sense of depth among themselves because of the occlusion and the obvious differences in volume among them. Yet what Picasso is also trying to accomplish here is the idea of a unified whole that is all on one plane--one guitar. Our eyes go back and forth from seeing this image as different parts on different planes to one unified plane. I think this game of playing with depth is exactly what Picasso was trying to achieve. Unlike the typical perspective in which the viewer looks straight into the scene depicted, Schiele elevates the viewer to give an omniscient perspective. As such, not all the conventional depth cues are employed. Occlusion is the primary depth cue. The luminance of the buldings and the sky are consistent throughout the painting, while the foliage is darker. Schiele thus creates a hierarchy which draws the viewer's attention to both the architecture and the horizon. There is no consistent vanishing point and the horizon floats above the foreground. By toying with perspective and depth, Schiele grants the viewer a special and subjective viewpoint which captures a complete picture of the character of the landscape and the architecture within it. ... the Paleolithic artist has utilized the small difference in the two surface planes of the cave wall in order to fashion the line of the horse's neck around the throat area. 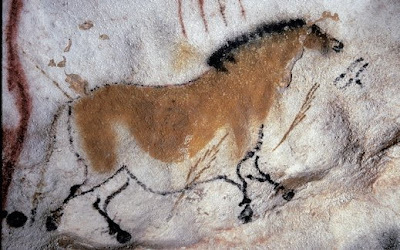 Although it's difficult to see in photographs, researchers who have seen the horse and others like it up close testify to the sense of depth that this technique lends to Paleolithic art. Movement can be instigated by and product of forces in the world acting upon one another. I was aware how intricate all the bodily systems are and how easily one influences another, but the discussions of physical, optical and perceptual movement As with most parts of visual perception, the brain has a system of expectation and organization for movement as well. The laws of organization that our brain is accustomed to are broken intoa hierarchical system. The brains inherent belief that if something is in motion, it is less likely to change than if it is stagnant. The brains categorization of movement is further specified as Albert Michotte showed the brain trusts the consistency of directed motion over that of color consistency. I appreciated the incorporation of several types of arts. The discussion of dance made many of the explanations about movement more tangible. Arnheim brings up several times that human body experiences movement in several ways, all effecting one another. The dancer experiences force through motion the viewer experiences the force by watching the dancer move.I though that the image examples in Arnheim for this particular chapter were most helpful. Braque's "Man with a Guitar" evokes the feeling of motion using several techniques.The rigid shapes provide force against the more subdued, blurred back ground. within a painting. The overlapping lines show chaos but somehow provide direction. These same overlaps, along with the color tones and shading create concavities and convexities down the whole piece. He also brings up how important movement is in sculpture. I have seen several pieces of sculpture, especially installations where the space and the movement within it makes the piece. When I first began this weeks readings I was thinking about how fast our culture moves and it's effect on our visual perception. On p. 384, mentions that our vision has evolved to fit our essential needs for survival. Has our visual attention span been shortened? In the days of MTV and high definition action movies our brains have to be altered from that of someone who lived pre technology. Our visual attention span is only seconds long, I find myself wondering when is our brain at full capacity with visual stimuli? David Parson’s Caught (1982) demonstrates the use of a strobe light in dance. I think it provides a really interesting way to think about how our brain puts together single moments to create a whole. In this example, the singular moment of a dancer suspended in air has a very different effect than the overall “gestalt” of a dancer leaping over a span of seconds. The long clip shows the whole dance (the strobe light comes in after a few minutes), but the quality is poorer. Watch the excerpt to get a better sense of how the dancer’s movement quality is altered through stroboscopic perception. Livingstone already examined artistic representation as 2-D depiction of a 3-D world. Now she looks at paintings as still depictions of a world full of motion. In a sense we are now urged to think about artistic representation in a 4-D world, with the addition of motion through time as a key aspect of human perception. Arnheim explores the concept that viewing of art always consists of time and motion. The viewer perceives any artistic work using his eye movement to perceive each part through time. However, Arnheim argues that order or eye movement in perceiving a work of art does not matter. Arnheim points to evidence from eye scans (Livingstone shows an example of this on page 78). Does anyone know if there is, in fact, canonical order of eye movements in viewing art? Or in viewing human faces? Arnheim goes on to apply the basic principles of Gestalt to art as 4-dimensional. Through time the brain must grasp the whole significance of artistic works and the whole work must be simultaneously present in the mind. He states that time creates succession, however, the artist (and the brain) must create the order or progression through time. Livingstone writes about how we maintain stability despite the movement of our eyes and explains that the brain remaps to compensate for eye movement. In studying infant perception for another class, I’ve been intrigued by how perception is inextricable from action and movement. I realized how much we take for granted what our body must do to allow for visual attention. For infants, visual perception, attention and focus is linked with the ability to control body movement, to hold the head and torso upright. There is a huge amount of work done in order to coordinate the motion of the body, the eyes and the external world with visual perception. Arnheim writes about the distinction between our kinesthetic reactions to inanimate vs. inanimate objects. He argues that endowing inanimate movement with life or consciousness is something that children and artists can access. He gives a great example of a thunderstorm that may be alive to a film director. I find this interesting considering studies of mirror neurons that question whether such neurons are activated by observation of human actions or actions of inanimate objects as well. Interestingly, some studies have showed that people with autism show mirror neuron activation in observations of objects more than in observations of actions of people. This calls to mind the importance of mirror neurons for basic social cognition. I believe that these studies really speak to Arnheim’s discussion of the differences between “expressive impulses and responses” in contrast to “the mechanical effect of physical action (402).” Arnheim seems to see the human body as unique in its motion because of the forces from within the organism. He argues that dance is created more from kinesthetic rather than visual understanding. Considering the evidence from the development of infant perception and the existence of mirror neurons, I believe that visual and kinesthetic senses are perhaps even more closely related than Arnheim states here. In addition, there may be something particular about human action and kinesthetic empathy that is crucial for humans as social beings. Livingston’s discussion on advertising ploys helped me to understand the function of the Where and What system in terms of motion and how consumers can be more attracted to certain types of color schemes and fonts when they are looking to purchase something. The film Fear and Loathing in Las Vegas jumped out at me as I was reading this chapter because it exhibited both Livingston’s point on advertising as well as Arnheim’s point about film editing and how we see motion in general. The jittery and agitated way in which the film is shot parallels its story-line about excessive drug use on the Vegas strip. The Vegas strip alone is notorious for its plethora of neon signs and flashing billboards. Marketers do this intentionally to grab attention and force the viewer to slow down. When letters of one color are placed against an equiluminant background, the words become difficult to read and therefore, one must slow down. Another technique is to create a noticeable contrast between letters and background because the Where system is very responsive to this. In terms of the film editing that Arnheim writes about, Fear and Loathing in Las Vegas switches from one scene to another using stroboscopic movement as well as choppy transitions. In doing so, the viewer is able to get inside of the minds of these drug addicts and feel like they experiencing the horrible “trip” as well. Finally, Arnheim discusses the three ways in which we perceive motion including—physical movement, optical movement and perceptual movement. He gives the example of a passenger on an airplane and how the cabin seems to be in complete stillness even though there is movement all around. This is how a human normally responds to their surroundings yet this film disrupts this natural tendency of ours to see motion as it exists in the real world. Another aspect of the reading that interested me was about Shakespeare’s play Hamlet. It does not follow the standard sequence of a story, but instead begins with the most exciting part of the plot (the apex) that would typically be found at the middle or end, and uses that as a starting point for the rest of the play. It opens with the murder of the king, followed by Hamlet’s discovery of the crime and then other events that bring us to the end. Sometimes, challenging the status quo of movement in literature makes for a more thought-provoking story. Let's Go to the Movies...in 3-D! This weeks reading, I felt, was quite similar to last weeks. Last week we read about how various perceptual tools allow us to view two dimensional objects as three dimensional. Luminance and shading play a large part in this process. This week the reading focused mainly on stereopsis and how we perceive depth. Over the centuries, since art began really, artists have been attempting to represent three dimensional objects or scenes on a two dimensional surface. Regardless of how precise the artwork is our stereopsis enables us to determine that what we are viewing is actually a flat depiction of something with depth. Many artists have also tried to manipulate the human perceptual system into seeing the flat rendering with depth. Livingstone mentions that Leonardo da Vinci wanted paintings to be viewed with only one eye and from a longer distance so that our stereopsis would be effectively circumvented. Such viewing was fashionable only for a short period of time. But Leonardo da Vinci's notion of tricking the viewer into seeing a three dimensional object reminded me of a modern visual fad very much on the rise. Livingstone briefly mentions the View-Masters that were/are popular for children. By presenting the eyes two identical images of a dinosaur spaced slightly apart we then see a three dimensional dinosaur. This notion has since been upgraded from just a still picture to moving images in the movies. Films in 3-D have become increasingly popular ranging from Imax documentaries to feature films. 3-D movies are produced by projecting two of the same images, slightly overlapping like in the View-Master. However, they images also have different polarization which is where the glasses come in. The lenses of the glasses filter in only one of the polarized images allowing each eye to see only one image. If you take off the glasses the overlapping and subsequent blur of the two images on the screen is painfully obvious. While we still view paintings as two dimensional objects I think Leonardo da Vinci would be fascinated by our modern trend of viewing moving images through a three dimensional lens. Here is the link to a recording of the piece I mentioned in my post. It is not the best representation of the piece, but it might give you an idea of the movement and what I was attempting to describe. I apologize for the lateness of my post. I wrote one and then had another idea so I decided to start over. Here goes. In the this weeks readings there was a lot of discussion of depth and how our eyes perceive dimensionality. There were many examples of different paintings and the different tools that were used to indicate depth. I am always interested in seeing how different choreographers use space and their dancer's bodies to indicate depth. While I was doing the reading I was reminded of the dance piece that Anne Teresa de Keersmaeker choreographed to Steve Reich's Piano Phase. In this piece the choreographer has set up two three dimensional bodies in a very two dimensional space. They spin together going in and out of unison for most of the piece. Depth and dimension is added when they break through that two dimensional (flat) space. They turn to then move forward through the space in a similar movement pattern. To finish the piece they travel back to their flat space. It is an interesting choreographic tool. She created a very flat space for two non-flat bodies then brought them out of their frame. De Keersmaeker also does something very interesting with the lights for this particular piece. She has designed the lights so the two dancers shadows are reflected on the back wall. However, the lights are placed in such a way that there are three shadows reflected on the wall. She creates the illusion that there is a third dancer somewhere in the space when really there are only two. Depth illusions can be shown through repetitive patterns in flat works. I wonder if the depth affect would be the same if the dancers were not doing the same repetitive pattern of movement? During the performance of the piece I found myself trying different ways of watching the movement. I would close one eye and then the other to see if my perception of the depth and movement was any different. I did not experience much difference in my perception. I suppose that there are many ways to indicate depth in a space with three dimensional bodies moving in it. Flat linear movement done on a frontal plane is often read as two dimensional, while more rounded movement executed on lower levels through the space could indicate a three dimensional space. Just in case people wanted to see the pictures I was referring to, I found out you can't put photos in the comments, so I'm posting them here. This is the Cynthia Carlson that I said had a sculptural use of the paint. This one is the Tony Gibbons I referred to, with the geometric shapes and patterns.